Double the dungeons, but half of the fun! Dungeon crawlers became quite popular back in the early 80's on many of the personal computers like the Commodore 64 and Apple II series of computers. I actually owned an Apple IIc computer and played many of the popular titles like the Wizardry and Bard's Tale series myself. 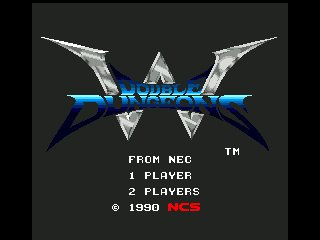 It's probably the main reason that I'm such a huge RPG fan to this very day. 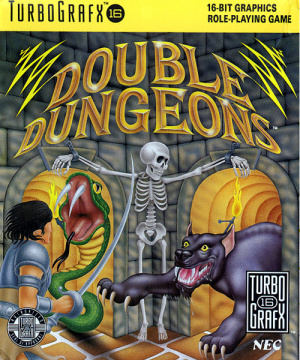 So you'd think that a game like Double Dungeons, that tries its hardest to mimic those classic role-playing adventures would be a nice trip down memory lane for me and others like me who enjoyed those classic computer games. You'd be wrong. Double Dungeons is a game that has the right idea, it just has a lot of trouble bringing that idea to fruition with any type of enjoyment at all. There's really not too much to the game play in Double Dungeons. 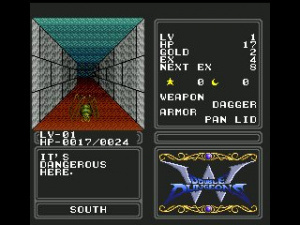 You basically use the directions on the control pad to move around the dungeon. Along the way you'll run into various enemies that you'll have to do battle with. Battles are pretty much relocated to one button that you'll get to keep mashing in order to attack the enemy. Occasionally you'll run into a shop that will allow you to purchase better armor and weaponry. Think of the whole experience as a treasure hunt with monsters thrown in for good measure. The game will even allow two players to take part at once, but this really adds nothing to the overall experience and no real friend would make someone else actually play this game, unless you're just looking to unload a few friends. 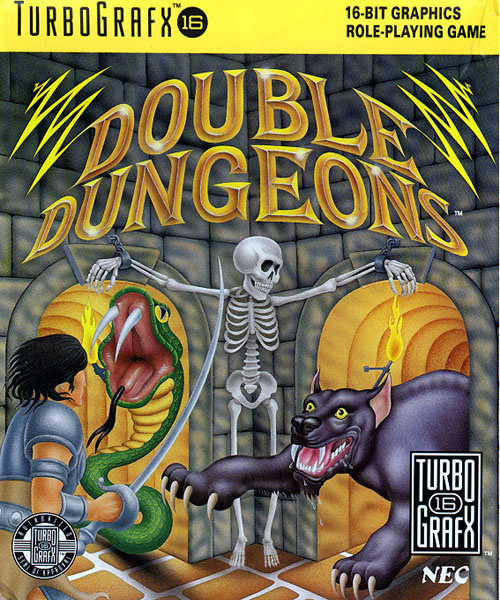 The visuals of those classic computer RPGs were nothing to write home about, but Double Dungeons even manages to fall short of even those 20+ year old titles. The only visuals you'll get are those featured in the small display area of the screen, and each and every dungeon has the exact same look to it. While the game will throw you a few new monsters here and there, the walls, doors, and shops all look exactly the same from the first dungeon to the last. Given that the game doesn't feature a lot of sprites to begin with, it seems a small thing to ask that some variety be given to the dungeons to keep things at least a little interesting. Trust me, it's clear from the first 10 minutes of playing Double Dungeons that this game isn't much on visual flash and that's actually being kind. I know those of you reading this are waiting for that magical moment when something positive is going to be said about this game, but you may be waiting awhile. 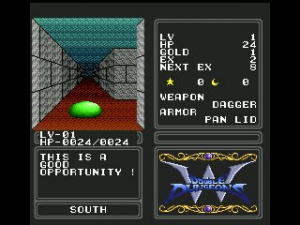 As if the bland visuals weren't enough, you're going to be treated to one of the most repetitive and dull musical pieces ever created for a video game during your dungeon crawling experience. And here's the best part of it. You're going to hear the exact same song during every single dungeon you go through. That's right people - by the time you play this game for a while, you're going to know this musical track backwards, forwards, and sideways. To be honest, you probably won't last half an hour with the sound up on this game before you turn the sound completely off and reach for the iPod. You can't tell me that someone couldn't at least come up with a couple of different tunes for this game. We know the extra effort certainly wasn't being put into any other phase of the game. Those who read my reviews know that I generally always try to find something good to say about any game I review. That being said, I sat and played this game for over 2 hours and the only thing I can liken it to is being on a family vacation back when I was a kid and being trapped in the car with nothing to do but watch road signs for hours. That's a little like what playing Double Dungeons feels like. It's like a boring road trip that just won't end. Every single aspect of this game is easily summed up in one simple word - repetitive. Normally this would be the part of the review where I say that if you're a big fan of this type of game then you might actually like it, but I am a fan of this type of game and I certainly didn't find anything to like about this redundant dungeon crawler. The best advice I can give you is to save your Wii Points for Splatterhouse that's coming next week, because this is just not a very good game at all. Yeah, I too had high hopes for this title but it's terrible. Avoid!